June 1943. "Washington, D.C. Pasting up a telegram at the Western Union telegraph office. 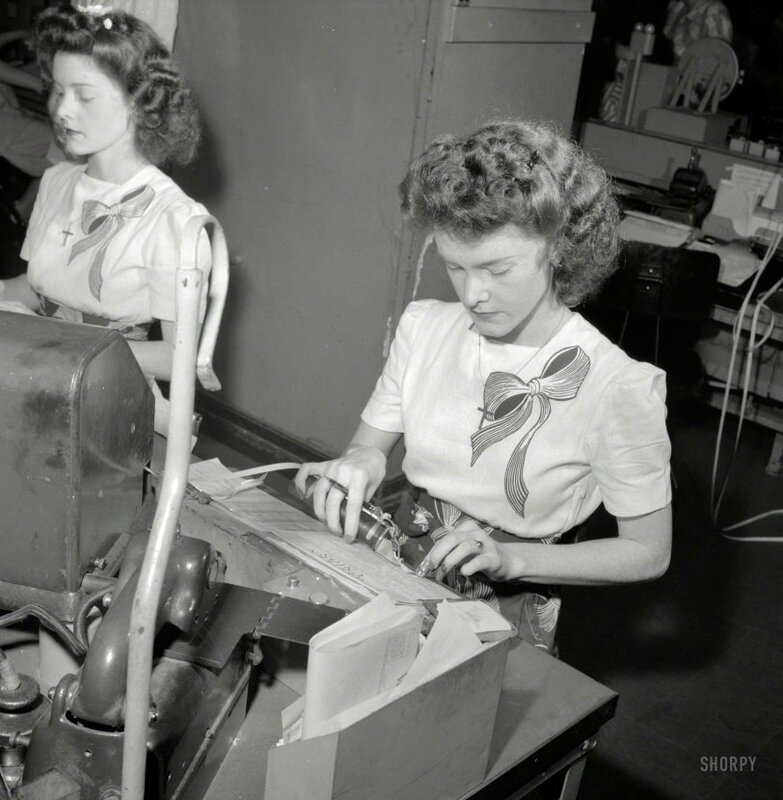 Doris and Dorothy Bell send and receive telegrams from the Baltimore circuit." If only Doris had been named Dash. Photo by Esther Bubley for the Office of War Information. View full size. Submitted by joemanning on Fri, 02/14/2014 - 1:44pm. This is Joe Manning. I just talked to Doris and Dorothy Bell, who live in Maryland, just outside of the DC line. Identical twins, they turned 90 years old several weeks ago. Neither ever married. They profess to be in good health. They know nothing about the 1943 photograph, but I am about to mail it to them. Stay tuned. Submitted by perpster on Thu, 02/13/2014 - 4:30pm. What did Ma Bell think of her daughters working for Western Union? Submitted by TheGeezer on Wed, 02/12/2014 - 2:25pm. It took me a moment or two, but the ham operator in me slapped me in the head: "If only Doris had been named Dash." Then they'd be Dash and Dot Bell!